Sicily’s intriguing history has drawn travelers for years to visit smoking volcanoes and famed cuisine. Somehow the island’s distinctive chocolate – made in the Unesco World Heritage town of Modica and inspired by the traditions of the ancient Aztecs – has remained one of the world’s best-kept secrets. When the Spanish were ruling Sicily in the 16th Century, conquistadors went to Mexico and brought back cacao and the recipes needed for what the Aztecs called xocoàtl. Xocoàtl a paste ground by a smooth round stone called a “metate”. Unlike the often over-sugared and creamy snack we know as chocolate, the original xocoàtl was bitter and used to enhance sauces for meat dishes. It was also grated over salads or eaten alone as a dietary supplement. If prepared with certain spices, it was considered an aphrodisiac. In Modica, generations of families have followed the same techniques, using metates crafted with lava stone from Mt Etna. Locals would mix the chocolate paste with sugar, “cold working” it so that the sugar doesn’t get hot enough to melt. This kind of technique gives the treat an unusual but deliciously crunchy texture. Then, they would incorporate flavors typically enjoyed on Sicily such as lime oil or pistachio. Today, flavorings are occasionally adapted to more modern tastes such as the current European fashion for sea salt chocolate. 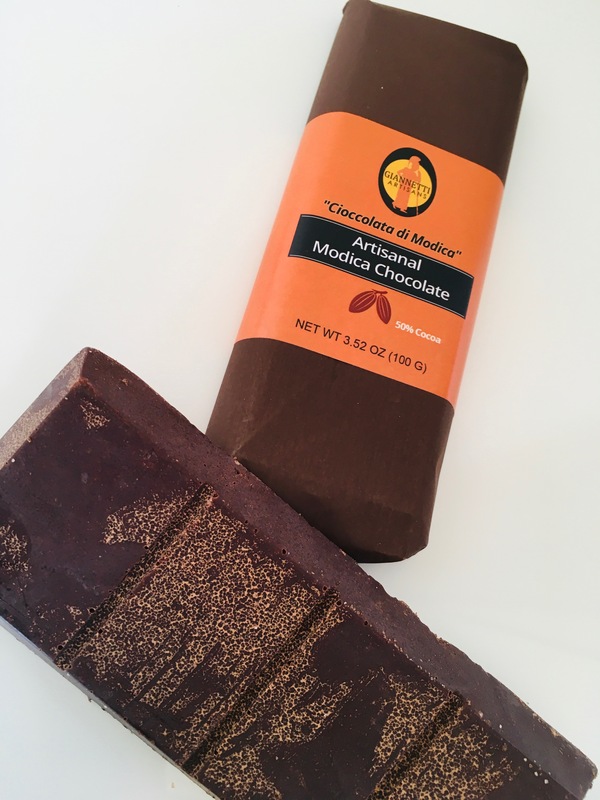 Modica’s businesses are serious about preserving and celebrating their chocolate traditions. (Even when th 1693 earthquake destroyed most of Modica’s infrastructure, the chocolate industry survived. In 2013, the Consortium for the Protection of Modica Chocolate published recipes dating back to the 1740s. In December, an annual festival called ChocoModica melds the town’s two most important features: chocolate and baroque architecture. There’s even a dedicated chocolate museum, the “Museo del Cioccolato”, located within the Palace of Culture. Inside, almost everything is made out of chocolate. From classical-style statues to a relief map of Italy. There are also videos demonstrating how the chocolate is made along with a valuable archive of historical recipes. Recently, Modica and the surrounding area were chosen as a filming location for the popular mystery series Inspector Montalbano and The Young Montalbano, bringing a new wave of tourists to discover the secret of Modica’s chocolate as they follow in the main character’s footsteps. But even if the secret gets out, the unusually prepared treat remains nearly impossible to find outside of Italy… unless you purchase it from Giannetti Artisans! Previous Post How is Balsamic Vinegar Beneficial for Your Health?